Flights returning 110,000 holidaymakers from overseas after Monarch's collapse will cost about £60m, according to the UK airline regulator. Transport Secretary Chris Grayling has called the flights the UK's biggest repatriation exercise in peacetime. Monarch Airlines ceased trading on Monday and all its future flights and holidays have been cancelled. 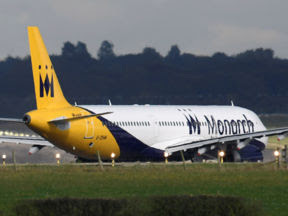 Administrators said 1,858 Monarch workers had lost their jobs on a "very sad and difficult day". The Civil Aviation Authority (CAA) hopes that about 12,000 customers will be flown home on chartered planes by the end of Monday. The government is set to pick up the tab for the UK's biggest ever airline collapse, but is talking to card companies about sharing some of the cost. Theresa May's official spokesman said the prime minister "feels hugely sorry" for those affected by a "very distressing situation". Monarch - the UK's fifth biggest airline - was placed in administration at 04:00 BST - a time when the airline had no planes in the air.